It happens every year. 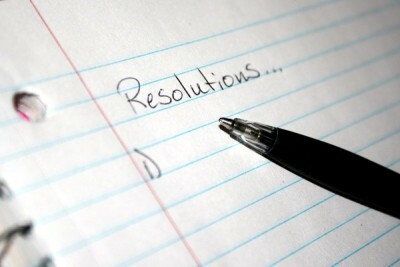 We resolve to break a bad habit or start a new, healthy practice. Gym memberships are purchased, e-cigarettes are ordered and refrigerators are stocked with apples and kale. Your teenager is enlisted to help move the flat screen out of your bedroom in hopes you will gain an extra hour of sleep each night while others are watching Jimmy Fallon. As January rolls in, our good intentions show up at the workplace, too. Like the new kid at school decked out in a hipster backpack and Converse sneakers, our noise canceling ear buds dangle from our necks and each wrist is circled with a device, one monitoring our health and the other our activity. We set the alarms on our calendars to remind us to drink more water throughout the day and call our mothers on Sunday. Taking steps to change behavior for the better is always a good idea, right? I mean, what could be wrong with focusing our energies on those things that help us to improve? Well, for the most part, there is absolutely nothing wrong with setting new goals in the New Year. Some researchers have found that writing a desired outcome down on paper or sharing a clear commitment out loud with others can increase tenfold the likelihood of achieving that goal. So, don’t get me wrong, there is only an upside to goal setting. However, it has also been said that less than 8% of the people who set New Year’s goals achieve them. This does not surprise me at all because setting a goal and achieving a goal are very different entities. It’s all in the execution, after all. In fact, after spending thousands of hours with leaders in the C-suite over the past 30 years, I have observed that New Year’s resolutions are NOT the best way to achieve important goals. The leaders who have been the most successful personally and professionally are those who regularly and quietly take stock of what is/is not working. Without any sign of insecurity, they check in with others throughout the year to “see how things are going”. They know that others can see what they cannot and that their perspectives are important to understand if business priorities are going to be successfully implemented. To stay the course, they are continually sensing and interacting, adjusting and readjusting how work is done and who does the work so that everyone in the business (or in their families, as the case may be) is pulling together to do the right things to succeed. Recently, I met with a long time client to discuss the leadership development needs of two key players in his business. I had been coaching this client, who had recently been named CEO, for a few years now, but I had also noticed that as the change-of-control event approached he was seemingly slowing down in his commitment to our work together. Each time we spoke about this perceived shift in his enthusiasm, he assured me he was simply in a reactive mode given the exceptional demands on him as he transitioned from COO to CEO. Despite these frequent reassurances, I wondered. How might I have kept him better engaged? Was it possible that I was no longer offering enough value? Was he just trying to let me down gently and move on? Although we continued to meet by phone and occasionally would meet off-site at our set meeting time for an intense coaching session or catch up, I chose to read his change in focus as a clear sign that he was approaching the end of his work with me, whatever the rationale. I fully expected that now that he was “officially” the CEO he would follow in the footsteps of many other new chief executives and choose to believe he no longer needed to spend time working on himself as a leader. I knew the ego could play tricks on the cognitive capabilities of a rising executive. The new title all too often reinforced the ready belief that one is a finished product. The leader who was once fiercely engaged in his or her learning and development while in the running for a top tier job would, more often than not, put the brakes on full force once officially ordained. Coach fired. Relationship over.